USEF will be held Tuesday March 12 through Thursday, March 14, 2019 at Rice Eccles Stadium. The Awards Ceremony will be held on Friday, March 15th at Juan Diego Catholic High School: 300 East 11800 South, Draper. Students attending public schools in grades 5-12 in the Salt Lake, Granite, Park City, Murray, Canyon and Tooele school districts. Charter and private schools are also welcome. 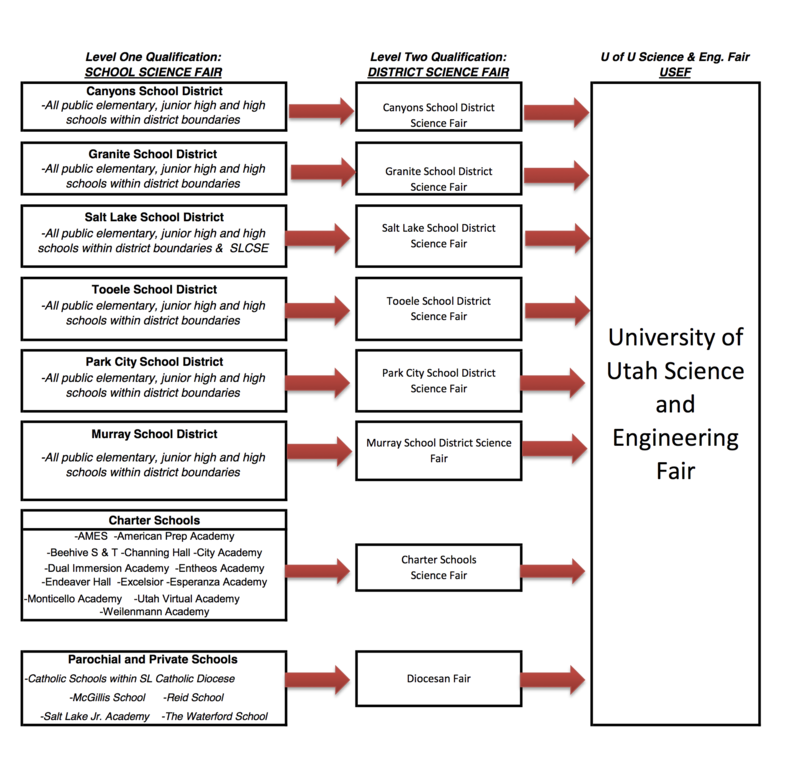 If you attend a school outside of these districts, please see the Utah Regional Fair map to find the fair you should attend. In order to be eligible to participate at USEF, you must have participated and won at your school / district fair & received an invitation to participate. Please refer to the eligibility 'roadmap' for details. How do I register for the fair? All students must register online with the user name and password obtained from their teacher or science fair representative. Senior division students must also submit completed Intel ISEF forms for their projects. I'm a Senior division student. How do I submit my ISEF forms? All 9th through 12th grade students will submit their forms online. Go here and create an account so you can get this process underway. Please refer to the fee schedule below for details. What division should I register in? Why do I have to register online? All students must register online to compete at USEF. The Online registration allows you to be entered quickly into the USEF database. The USEF database is used to create judging cards, organize the winner lists, and create certificates and all other printed materials. What forms do I need with my senior division project? All senior division students are required to submit the forms used at Intel ISEF. Different types of projects require different types of forms. Additional forms are required for projects involving human subjects, vertebrate animals, controlled substances and/or potentially hazardous biological agents. Go here and create an account to get started with your ISEF paperwork. You'll be able to answer a few questions about your project to determine what forms you'll need. Can parents help with a project? One of the great things about a science fair is that there is room for parental involvement. By sharing science experiences parents demonstrate that learning is an important and enjoyable process. The key point is that parents not do too much. Parents can offer advice, help gather materials, assist in constructing the backboard, and proofread grammar. The research and overall project should generally reflect the student's efforts. Does my project need to be reviewed by an SRC/IRB at my local school prior to experimentation? It depends on your choice of project. Use the Intel Rules Wizard to see what forms need to be submitted. This should be done prior to the onset of any experimentation. If you have any questions about this requirement, please contact us. Is it ok to get SRC/IRB approval after I have collected my data? No. The whole purpose of SRC/IRB approval is to have the committee approve your project before you begin data collection. This will insure that ethical guidelines are met and followed. Can my parents or teacher set up my project for me at Rice Eccles Stadium? Yes. Just be certain that all materials you plan to display are present in order to be approved by a safety and display judge. What can I include on my project board for the fair? The Visual Display requirements are listed here as well as some additional tips and advice. Also, note that no photos of others are allowed, unless a signed release form has been submitted. How should my project be displayed on the project board? Your display will be a visual aid that will briefly state all the important aspects of your project: problem, hypothesis, experiment description, results/analysis, conclusions and applications. When do I set up my project? You will need to set up your project on different days depending on your division. Please refer to the fair schedule for details. How early should I be at the fair? Students should arrive 15 minutes prior to when judging begins for their division. Please refer to the schedule for when that is. Yes. Box lunches will be provided for students and judges. You can choose between three box lunches when you register. (choices cannot be changed once made). We will deliver lunches to students by Noon at their projects. They can then choose when to eat them. Please remember to bring your own water bottles as we won't be providing a beverage with the box lunches. Parents and siblings of students who attend the science fair will need to make their own arrangements for food. What should I wear to the fair? We recommend that you dress professionally but comfortably. What should I bring to the fair? The judging process is lengthy with a lot of "down" time. We recommend that you bring a book to read or homework to work on. Hand held games and/or iPods are allowed as long as they are put away during judging interviews. Be sure that whatever you bring is not a distraction to yourself or others. Will my valuables be secure at the fair? We recommend that if you need to bring a computer or other valuable items with you to display at the fair that you only have them out on display while you are with your project. Is there a time for the public to view the projects? The exhibits will be open to the public. Please refer to the fair schedule for details. How are projects judged at USEF? You can read about how we judge projects here. Do I have to stay for the entire judging period? Yes. During the judging time there are category judges and special award judges that are interviewing students. You need to give them an opportunity to talk to you. What if I can't come to USEF during the judging time? The judging interview is the most important component of the judging process. If you cannot come at all, we recommend that you do not set up your project. What if I have a conflict and I have to leave the fair early or come late? Please notify a science fair representative immediately of your circumstance so we can inform your judges. We cannot guarantee that you will be judged as many times as you need to be. Do all members of my team have to come during judging? Yes. It would otherwise be difficult for the judges to understand the contributions of each team member. Team projects without all members present will receive a hefty team deduction on their final score. How long does the judging last and when can I leave? The length of judging varies. It is important to stay with your project until a science fair representative notifies you that you're free to leave. If my project fails to qualify for improper procedure or missing forms, will I receive a refund of my entry fee? No. We cannot give refunds to projects that fail to qualify or are withdrawn. It takes time and resources for the USEF to review all of the projects, entered or not. If my project fails to qualify for improper procedure and/or missing forms, can I still participate in the fair? No. Only projects that are fully cleared by the regional SRC/IRB can participate in the fair. If you have additional questions about the USEF, forms, procedures, individual projects or anything else we've missed, we would like to hear from you-drop us an email. We'll do our best to get you an answer.